This Myola tree frog (Litoria myola) is a regular visitor into our house. We actually had to move the frog outside on two occasions in recent weeks. We were sure we were dealing with the same individual as we noticed it had a couple of parasitic fly larvae under its skin. We generally don't interfere with wildlife, preferring to observe what we see and let nature take its course, but in this case curiosity got the better of us, and decided to give the frog a hand and remove the parasites. The parasite is a fly in the genus Batrachomyia (Diptera: Chloropidae) and is apparently not life threatening to the frogs, however, having two large maggots feeding on body fluids beneath your skin cannot be comfortable. The larvae remain under the skin until they are sufficiently developed then crawl out in order to pupate underground. The larvae maintain a breathing hole to obtain oxygen (marked with arrows in the image below). We were able to extract them through these holes quite easily. 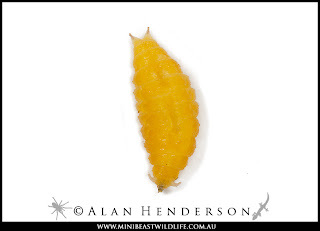 The larvae were bright yellow and 10mm long. This frog now has at least two less worries to contend with, although last night I we found it sitting on the driveway right behind the car when we were about to back out. Now it owes us three favours! The parasite free frog which should heal completely in a matter of weeks. One of the two Batrachomyia sp. larvae which were removed from beneath the frog's skin. The head has two hook-like appendages while the forked tail end remains close to the hole in the skin in order to breath. Each larva remains under the skin until it is sufficiently developed then crawls out in order to pupate underground. Suprisingly, Hoskin, CJ and McCallum, HI (2007) found no evidence that Batrachomyia parasitism impacts on the body condition of these particular frogs, however, another study on several smaller species of frogs did show measurable impact on smaller specimens.